Julia is the Naval Officer of Space City, a spacecraft colony inhabited by 5 million people. The spacecraft was on a 2,000-year journey to a viable planet but was hit by an asteroid and destroyed a few decades before reaching its objective. It is Julia’s task to find a new planet for the people of Space City. She and her team find an unknown planet but before being able to observe it, they are caught in its atmosphere and forced to land. Once on it, Julia decides to inspect it and goes on a tour of the planet, leaving her team behind. She finds the source of the planet’s energy which leads her to inspecting the plants’ secrets, which will change everything she thought she knew. In Psy’s Last Mission, Julia is the naval officer of Space City, a spacecraft colony inhabited by five million. Julia is tasked to find a new plane for the people of Space City, and when on the lookout to investigate a new planet, they’re caught up in the planet’s atmosphere and are forced to land. 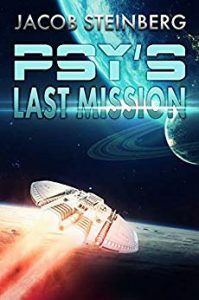 Once on the planet, Julia decides to inspect it while leaving her team behind, and as she tries to find the source of the planet’s energy, she’s in for more than she bargained for. I wanted to like this book, but I couldn’t like it as much as I had hoped I would. Some ideas were great, but the execution was lacking. Some chapters were very well-written, others were bland. The editing could also be better overall, and this brought down the reading experience a lot. Some parts of the book were over-the-top and even made me roll my eyes. Overall, though, it had a solid story and some fun surprises.